Keep a record of all the necessary information about your employees. Fill in additional information about your business associates. Set which notifications will display, your profile photo, new address or a phone number. Who would find the People module most useful? The People module works as a tool for HR workers, as well as for other employees, to save contact data. Personal data, data for HR workers and also e-mail communication with business associates are saved in this module. Individual entries in the People module may be saved in your contacts, you can set a synchronisation with your mobile phone, thanks to which you will keep a list of accurate and up-to date contacts. Any change in a contact number, address etc., is also changed in the corporate database of contacts. What is found in the People tab? HR workers use this module to register everything important about employees or applicants. Thus, they have an overview of newly accepted person, his job position, or previous work experience. The People tab serves also as a basis for the accounting department. Each profile has an “synchronize with a mobile device” function, thanks to which sales managers always have the most recent data and gain access to the whole corporate database of people and customers. Advanced settings allow to create a new People entry from contacts. Get to know new colleagues thanks to their profile with a profile picture. Every employee has his own profile photo, which is displayed in every communication the employee takes part in. Thus, you can always see with who you are working on a task. Employees set their contact info, including social networks and job position in their profile. Don’t miss birthdays and boarding anniversaries of your colleagues. The Important events module displays birthdays, boarding anniversaries and name days directly on your dashboard. You will never forget to congratulate your colleague again. Create notes for meetings, display the attendance of your division or be notified about important events of your colleagues – all in one place, in the Calendar module. To make the Calendar more informal, you can set a nickname for each employee. 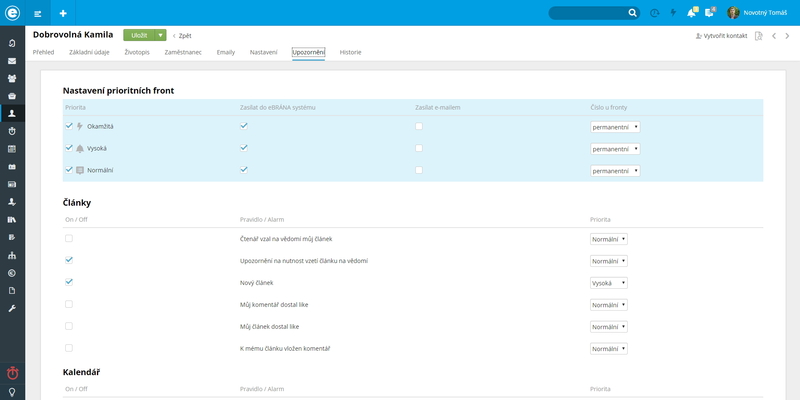 Deal with tasks, requests or business communication easily with the eBRÁNA Tasks module, to which you save all of your work-related activities. Every activity is bound to a Projects entry of a customer.